Every week, New York Magazine writer-at-large Frank Rich talks with contributor Eric Benson about the biggest stories in politics and culture. This week: Darrell Issa does his best Inspector Javert, Mark Sanford wins back his old seat, and Jim DeMint and Marco Rubio fire their opening salvos. 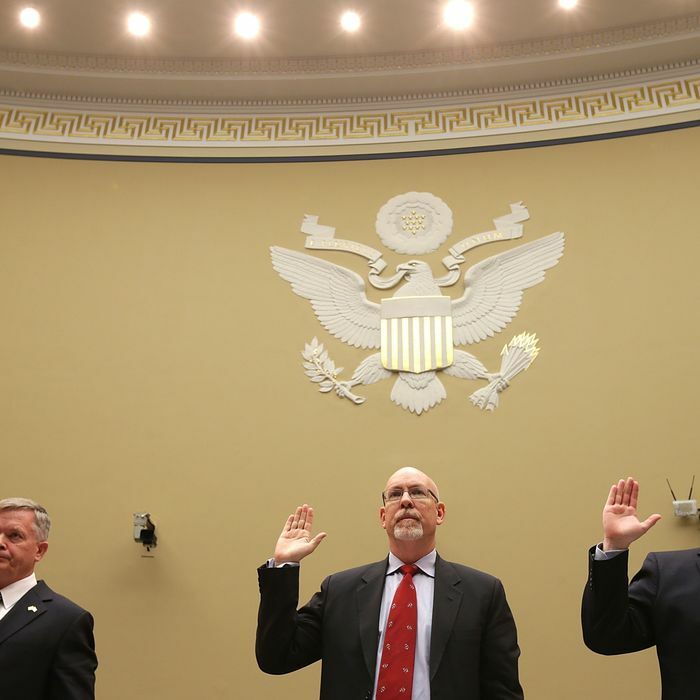 The House’s Inspector Javert, Congressman Darrell Issa, held a hearing on the Benghazi attack yesterday at which a State Department official, Gregory Hicks, charged the administration with incompetence and worse. Mike Huckabee said that Obama will be impeached for Benghazi. Others suggest it’ll badly damage Hillary Clinton’s presidential prospects. Is anybody, Fox News included, going to be talking about this story six months from now? It’s not entirely clear that anyone is talking about it even now once you get beyond the Beltway and the GOP’s Fox News base. Even Hicks’s emotional testimony yesterday was overshadowed on television by a different kind of horror story emerging from Cleveland. Why are the Republicans getting so little traction with this story? After all, they have been pounding it for eight months. They believed that Benghazi was figuratively as well as literally the 9/11 of 2012, and that its fallout would usher Romney into the presidency. In fact, it barely registered as a concern in any polls. Now they believe (in Lindsey Graham’s characteristically understated judgment) that Benghazi is “every bit as damaging as Watergate,” a gateway both to the president’s impeachment and to a GOP victory over Hillary in 2016. Yet no one else does. There are several reasons: Clinton has taken responsibility for the systemic failures that occurred on her watch; Republicans in Congress have not been able to deflect their own share of the blame, the budget cutbacks that shortchanged embassy and consulate security; Susan Rice’s endlessly parsed talking points notwithstanding, no one to the left of Sean Hannity seriously believes that the Obama White House was trying to cover up a terrorist attack. But the main explanation for Benghazi’s inability to catch fire with the public has to do with the American intelligence failure that led to the original 9/11 in which 3,000, not four, Americans were killed: Bush and Cheney’s inability to heed such warning signs as the President’s Daily Brief of August 6, 2001, “Bin Laden determined to strike in US.” Many of the same voices who are pounding Obama and Clinton on Benghazi — Graham, for instance — are the same ones who defended that lapse and then cheered on an Iraq War that drained resources from the battle against Al Qaeda and the search for Bin Laden. They have no credibility. And they are overselling the failures of Benghazi much as they oversold Saddam Hussein’s nonexistent WMD. If you read the intricate conservative briefs vilifying Hillary in the aftermath of yesterday’s testimony — check out this one — you can see that the Hillary-haters have not found another Watergate but another Whitewater. It should keep them very busy through 2016 even if the public continues to turn a deaf ear. Former South Carolina governor Mark Sanford won back his old Congressional seat on Tuesday. Sanford’s chances looked poor last month after news leaked that his ex-wife had filed a trespassing charge against him and the National Republican Congressional Committee pulled its support. Was this simply a reliable conservative winning a reliably conservative district, warts and all? Or should we read anything into Sanford’s victory about the declining importance of a candidate’s personal values to the U.S. electorate? Yes, and yes. Even if Sanford’s Democratic opponent, Elizabeth Colbert Busch, had eked out a victory in this special election, she likely would have lost the seat to a Republican, whoever it was, in this conservative Dixie district’s next regular election. And Sanford’s victory does demonstrate once again that the religious right is spent as a force in the 21st-century GOP. A Republican can mock “family values” and “traditional marriage” as much as he wants and still win even in what used to be Christian Coalition country as long as his conservative ideology hits every secular benchmark. The Senate Judiciary Committee takes up the immigration-reform bill today, after a week in which Jim DeMint’s Heritage Foundation argued that the law would cost taxpayers trillions and Marco Rubio, the leader of pro-reform Republicans, returned the fire and questioned Heritage’s analysis. Meanwhile, the Times reports that GOP opponents of the bill are planning to hijack it during the amendment process. Rubio has staked a lot of political capital on this bill. Is he going to get it passed? I wouldn’t bet on it. The battle between the former close allies DeMint and Rubio crystallizes the larger “rebranding” battle in the GOP since Election Day. And it’s going to get ugly. Republicans with national ambitions like Rubio are desperately hoping to win back a fast-growing Latino electorate that in general regards his party as a haven for nativist bigots. But there are many in the base who still want an electrified fence, not “amnesty,” for undocumented immigrants. DeMint is their champion (as is virtually every right-wing talk-show host), and now that he is at Heritage, he can concoct bogus pseudo-academic research to buttress the anti-reform argument. Indeed, it turns out that a co-author of the Heritage economic analysis that DeMint pushed this week is also the author of an earlier scholarly paper warning that “new Hispanic immigrants will have low-IQ children and grandchildren.” That’s further evidence, if any was needed, of what I wrote in my essay in New York this week: The modern GOP, for all its talk of new outreach to minorities, is still haunted by the ghost of one of DeMint’s immediate predecessors as a South Carolina Senator: the white supremacist Strom Thurmond. New Jersey governor Chris Christie revealed on Tuesday that he has undergone “Lap Band” surgery, which, of course, doesn’t necessarily say anything about his political ambitions. After all, Christie is too liberal and too admiring of President Obama to win GOP primaries, and now Michelle Obama has called him “terrific.” Still, polls show him cruising to reelection and the party has a thing for nominating Establishment candidates. Could he? And, maybe more important at this juncture, do you think he thinks he could? Christie is very popular in New Jersey, a fantasy president to the dwindling ranks of moderate Republicans (many of whom are next door in New York, particularly its financial sector), and an egomaniac who certainly thinks he could be president. (His speech at last summer’s Republican convention was widely regarded, and reviled, as an advertisement for himself, not Romney.) But I’d say his presidential prospects are about the same as that other centrist-Republican heartthrob of elites in the Northeast, Michael Bloomberg — nil. That said, once they’ve both graduated from local office, Christie and Bloomberg would make for a highly entertaining odd-couple pairing if any network wants to offer a fresh morning-television alternative to Kelly and Michael, Mika and Joe, and Hoda and Kathie-Lee.